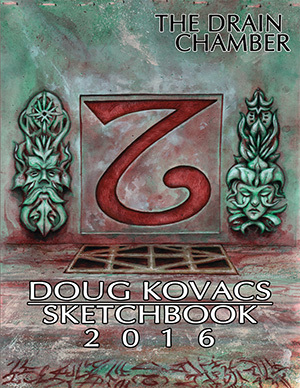 The Drain Chamber: Doug Kovacs Sketchbook 2016 was written and illustrated by Doug Kovacs, with an introduction by Joseph Goodman. The publisher is Goodman Games. When one thinks of Dungeon Crawl Classics, three figures loom large over all others: Harley Stroh, Michael Curtis, and Doug Kovacs. 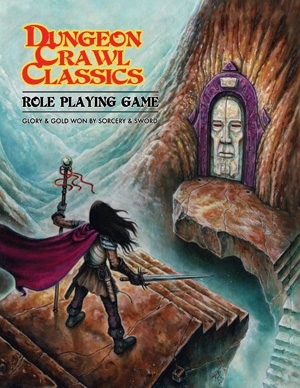 Of the three, by setting the overall look of both the official Dungeon Crawl Classics line, as well as several third-party products, Doug Kovacs may have had the greatest influence. I would imagine that Joseph Goodman feels much the same, because he gave each of them a chance to showcase their work in three unique products: The Devil's Chapbook (Harley Stroh), The Drain Chamber (Doug Kovacs), and Scrivener of Strange Wor(l)ds (Michael Curtis). Each may be considered a compilation of fragments, and an insight into works in progress. You might imagine that, as an artist, Doug Kovacs offers the least directly game-able content of the three. In some ways, you would be right, as the focus of the book is on the visual medium, but in another way you would be wrong, because the game-able content is both pretty interesting and more prevalent than may be expected. I know that I am happy that I own all three. Herein, I am focusing on what is game-able, but if you are not spending some time drinking in Doug Kovacs' illustrations, and possibly considering how to turn them into game-able materials, I fear that you are missing the point. Or a point, anyway. Flipping open the cover, we begin with four new monsters (Red Gowl, Faerie Slug, Beastman Shaman, and Miserable Flamesquat) and a d40 (!) table of "people and folks" - faces drawn by Doug Kovacs. Of the four new monsters, you will probably get the most use of the Beastman Shaman, but the Faerie Slug is my favorite. The Gowls you may be familiar with due to their appearance in the official DCC dice sets. Page 4 is a Pencil and Watercolor for the back cover of the Dungeon Crawl Classics Role Playing Game: Annual. Page 5 is a Pencil and Watercolor for Dungeon Crawl Classics: Lankhmar. Not game-able per say, but it may make you salivate if you love this game as I do. Likewise, the illustrations of The Band on pages 8-9 are part of what has made the official Dungeon Crawl Classics adventures great. I certainly enjoyed seeing their appearances and misadventures throughout the DCC oeuvre. Page 11 is "50 Things Found in that Bag, Box, or Hole". You'll have to decide what properties they have. Pages 12-13 comprises the map of "The Spine Wizard's Closet", the seed for as many adventures as there are judges. The illustrations on the map and rooms should inspire many interesting, or perhaps terrifying, encounters. That's nine pages out of 26, including inside (but not outside) covers. Being Doug Kovacs, though, you should probably include the covers. The point I am trying to make here is that there is an abundance of cool artwork, and that cool artwork is in no way limited to the immediately game-able content. DCC #82.5: Dragora's Dungeon is a 1st level adventure written by Harley Stroh. The cover is by Clyde Caldwell. Interior art is by Jeff Easley, Doug Kovacs, Stefan Poag, and Michael Wilson. The publisher is Goodman Games. Disclosure: I converted this adventure to Dungeon Crawl Classics. This is the first of the "Master Dungeon" Series modules for 4th Edition Dungeons & Dragons that I converted to Dungeon Crawl Classics for Goodman Games. (The second was The Curse of the Kingspire, also by Harley Stroh). I am not by any means a fan of 4th Edition Dungeons & Dragons, but Harley Stroh comes close to making me want to give that system another try. This adventure is extremely Appendix N, in my opinion, making it a joy to convert. There were a few things that needed alteration, however. Tiamat was too tied to Dungeons & Dragons, so I created the dragon-god Baphotet Kor to take her place. The scrolls on page 19 required some work to make them fit into Dungeon Crawl Classics, as did some other magic items, but there was far less creative work needed than one might think, considering the differences between the two systems. This is, I think, more a testament to Harley Stroh's strength as a writer than anything else. Paring down the enormous 4th Edition statblocks to the essential build of the monsters involved does require work. Certainly more work than converting 3rd Edition or 1st Edition monsters. As far as I know, this is the first official Goodman Games adventure to feature a dragon, and I rebuilt the dragon to conform to Dungeon Crawl Classics expectations. There is a good chance that PCs who do not know when to cut and run will experience a TPK at the climax of this adventure...but that was also true when Harley Stroh first wrote it. Another issue with converting 4th Edition adventures arises from the skill challenge mechanic. In previous editions of Dungeons & Dragons, as in Dungeon Crawl Classics, the same types of actions would be resolved via a combination of role-playing, negotiation, and, in some cases, one or more die rolls. Not having to roll the dice would, in fact, be the preferred outcome for the players. Let's call this "accomplishment by description". I have little doubt that, by formalizing non-combat challenges, the authors of 4th Edition reminded (or taught) many Game Masters of the importance of non-combat events to the narrative flow of role-playing game adventures. The difficulty, of course, is that the formalized system can both reduce creativity (because, ultimately, it is the rolls that count) and seem arbitrary (because the focus is on rolling a check with X, rather than having a role-playing decision result in a roll with X). In the case of Harley Stroh's writing, skill challenges seem both flavorful and meaningful, so it was important to keep the sense of them while eliminating much of the formal mechanics. I hope, in some small part, that I succeeded in this. To my mind, Stroh's 4e modules are a clearer predecessor to the tone and feel of the Dungeon Crawl Classics RPG than many of the Goodman Games 3rd Edition modules were. Finally, when the Dungeon Crawl Classics version of this adventure was released, there was a bit of controversy about the cover on G+ and Facebook. I don't know if the same was true when the adventure was released for 4th Edition. While I personally have no real difficulty with the cover - and it is a definite homage to the earlier days of Dungeons & Dragons - I can understand why some would find the clear "cheesecake" factor off-putting. It would definitely be cool to see a Doug Kovacs or Stefan Poag alternative cover at some point. 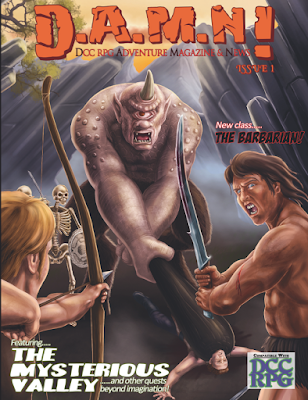 DCC #66.5: Doom of the Savage Kings is a level 1 adventure written by Harley Stroh. The cover is by Doug Kovacs. Interior illustrations are by Doug Kovacs and Stefan Poag. This adventure was published by Goodman Games. I have discussed this adventure in some detail on Raven Crowking's Nest, and I don't have a lot to add to it. 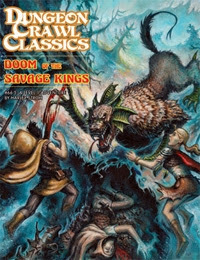 Doom of the Savage Kings was initially available, in print, as a special addition/incentive for those who pre-ordered the Dungeon Crawl Classics core rulebook first printing. I was one of those. This is actually the third Dungeon Crawl Classics adventure that I ran, having previously run Portal Under the Stars as a trial adventure, and Sailors on the Starless Sea as a 0-level funnel. The PCs from Sailors went on to face the Hound of Hirot in Doom. From here they went on to a DCCified version of James Raggi's Death Frost Doom. In many ways, this adventure exemplifies what makes Dungeon Crawl Classics great. It gives good examples of "death throes" (both in the Serpent Mound and with the Hound itself), it has an excellent witch, it deals with human conflict as well as supernatural conflict, and it pits 1st level PCs against a demon. Better, it demonstrates both the dangers of magic items, and the "Quest For It" nature by which a standard item may become enchanted. This adventure, however, is not incredibly "gonzo". It takes place within the area of a believable village, with believable characters within it. The secondary sites, like the Serpent Mound and the lair of the Hound, are equally believable within the context of the setting. This adventure is very firmly grounded. As much as we may enjoy journeys to other worlds and mixing our science fantasy with our fantasy fantasy, it is nice to have some really solid products that demonstrate that Dungeon Crawl Classics is great without requiring mind-bending alterations to the expected game setting. Dispatches from the Raven Crowking V.3: Building the Sandbox was written by Daniel J. Bishop. Art was provided by Brett Neufeld, Kristen M. Collins, Ryan Rhodes, Gary Dupuis, and Brian Brinlee. This was published by Purple Duck Games. Disclosure: I am the author. As with Volume 1, the cover illustration doesn't represent me. Despite rumors to the contrary, I am not a female goblinoid...or am I? This volume focuses on articles related to creating sandbox environments. Although these articles use the excellent Dungeon Crawl Classics system, the general principles are adaptable to almost any game system. In essence, most of this volume is one long essay, broken up into digestible chunks, describing what a sandbox is, why you might want one, and then how to make one. I also expand on the centaurs available in the Dungeon Crawl Classics core rulebook, both with a table of random attributes, and with two examples of centaurs from Greek mythology that are modified to fit into a Dungeon Crawl Classics campaign. Dispatches from the Raven Crowking V.2: Designing and Running Adventures was written by Daniel J. Bishop. Art was provided by Tamas Baranya, Brett Neufeld, and Gary Dupuis. This was published by Purple Duck Games. Disclosure: I am the author. Brett Neufeld was provided with a couple of photographs to work from, and produced a fantasy illustration of me for the cover. He kindly gave me less grey, more hair, and less belly, but it is otherwise a damn fine reproduction of your humble (?) author's appearance. The dragon is optional. You will note that from Volume 1 to Volume 2, a "the" crept into the title. It is now Dispatches from "the" Raven Crowking. If you pay close attention to the introductions, you will note that the original title was intended to be Dispatches from Raven Crowking's Nest. While Volume 1 focused on effecting judging, Volume 2 focuses on designing adventures that work. Anyone who has read more than one of these volumes will note that the gaming philosophy of one bleeds into the other. Although each volume may be read separately, you will get more out of them if you read them all. But, then, I would say that. Introduction: You have read introductions before. Apart from some nice (and deserved!) words about the Dungeon Crawl Classics community, there is nothing new here. Basic Adventure Design: Some basic notes on designing adventures, including some insights into actual products that I have worked on. Using the Table to Your Advantage: When designing an adventure for a role-playing game, it is sometimes useful to consider not only what is happening in the fictive milieu, but also what is happening at the table. Advanced Adventure Design: A lot of original blog posts are put together into an essay on adventure design that builds upon the first article. Here we discuss Footprints and Offstage Material, Hooks and Win Conditions, Objectives, Sudden & Dramatic Reversals, Empty Spaces, Junk, Meaningless Encounters, and adventures using dreams. Killing Fields: If you consider games in which encounters tend to be "balanced" against party level, you will quickly realize that character growth has no objective measure against the fictive milieu. A "killing field" is an area that less powerful characters simply cannot survive, which exists even when characters are less powerful. How Much is Too Much? : Short answer: Don't worry about it. Longer answer: How to make it your players' problem, not yours. Working For a Living: Why your PCs can't simply make stuff instead of going into dark and dangerous spaces for fun and profit. Well, they can, but it is not as easy as the players think. Your Dungeon Crawl Classics Monster Manual: Monsters should be unique, but creatures in the world are not always so. In the Dungeon Crawl Classics game, Appendix L suggests strongly that certain creatures probably exist in most DCC worlds....their languages do. Likewise, the descriptions of certain creatures imply as assumption of qualities both known and unknown. This article includes The Following Thing, a nasty encounter that you can use against your PCs. Dispatches from Raven Crowking Vol 1: Choices, Context, and Consequence was written by Daniel J. Bishop. It contains artwork by Tamas Baranya, Jacob Blackmon, Gary Dupuis, and Ryan Rhodes. It was published by Purple Duck Games. Disclosure: I am the writer. That is not actually a picture of me on the cover. Really. As the name implies, Dispatches has its genesis in my blog, Raven Crowking’s Nest. Dispatches has a few advantages over the free blog versions of the same material. First off, the material has been re-edited, cleaned up, and in some cases expanded. Secondly, and perhaps most importantly, it is in print so that you can keep it on your gaming shelf. Finally, Dispatches will contain some new material as well…a “thank you” for your continued interest! The genesis of Dispatches is relatively simple: Mark Gedak of Purple Duck Games thought of it, and asked me if I was willing to do it. And I said "Sure". It is important to note that the free versions of any material reworked for Dispatches is still available on the blog. Introduction: A simple introduction, from which I extracted the above paragraph ("As the name implies..."). Choices, Context, and Consequences: This article encapsulates what is probably the most important bit of gaming advice I know. It deals with the interplay of player choice; context provided by the system, the setting, and the judge; and the consequences of player choice, which in turn create a new context for new choices. Prepare for the Epic Endgame! : Great adventures are about great stories, right? Well great campaigns are about great stories, too, and that epic finale should be telegraphed from the beginning. There are two things to keep in mind: that epic endgame is the character's endgame, not the campaign milieu's (usually), and that there should be at least three possible endgames presented to allow the players choice. Fudging - Just a Different Style? : Short answer: No. Reading Appendix N: A series I started for my blog, which is more-or-less made redundant by the appearance of the excellent Sanctum Sanctorum podcast. In this case, I look at Edgar Rice Burroughs' The Efficiency Expert and Sterling E. Lanier's Hiero's Journey. Shanthopal: Background to the Golden City: My own urban milieu-in-progress. Using Patrons in the Dungeon Crawl Classics Role-Playing Game: A slightly modified version of the article that appears on my blog and in Angels, Daemons, and Beings Between. Devising Initial Adventures for Dungeon Crawl Classics: Escape from the Shrouded Fen, by Terry Olson, is, to my knowledge, the first funnel adventure to fully embrace the recommendations herein. 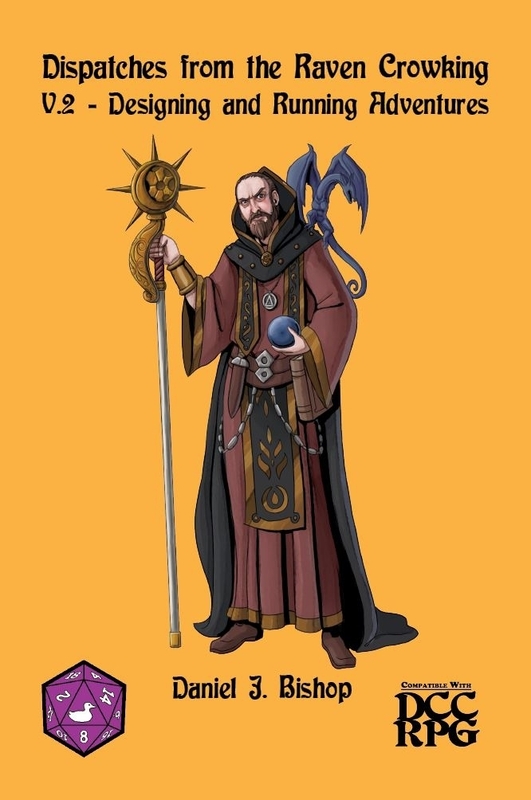 Learning Spells on the Fly, or, The Slippery Slope of Arcane Doom: By the book, Dungeon Crawl Classics wizards need at least one week per spell level to learn a new spell. But what if they don't have the time? What if they want to try to learn that spell right now? Ammonites for Dungeon Crawl Classics: Because new monsters are always useful. 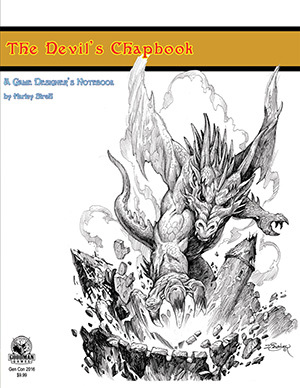 The Devil's Chapbook: A Game Designer's Notebook was written by Harley Stroh. The cover features art by Jeff Easley, and the interior art is by Doug Kovacs. It was published by Goodman Games. Disclosure: I am mentioned in Harley Stroh's introduction. When one thinks of Dungeon Crawl Classics, three figures loom large over all others: Harley Stroh, Michael Curtis, and Doug Kovacs. To my mind, their influence is even greater than that of the game's creator, Joseph Goodman, in that they have created between them the look and feel of the majority of official DCC products. I would imagine that Joseph Goodman feels much the same, because he gave each of them a chance to showcase their work in three unique products: The Devil's Chapbook (Harley Stroh), The Drain Chamber (Doug Kovacs), and Scrivener of Strange Wor(l)ds (Michael Curtis). Each may be considered a compilation of fragments, and an insight into works in progress. Introduction: City of a Thousand Missed Deadlines: In which Harley Stroh discusses his fabled city of Punjar, its support, and the fact that there is still no official Dungeon Crawl Classics release for the city proper. In this piece, Harley Stroh gives Doug Kovacs credit for curating the city, sharpening and honing the material "like a murderer grinding blades in the dark". Mockup Intro for DCC RPG Punjar CIty Set (2014): Yes, you read that right. Harley Stroh wrote an introduction for a Punjar boxed set in 2014. With Michael Curtis' DCC Lankhmar coming in early 2017, it seems unlikely at the time of this writing that this introduction will be used anytime soon. Still, if you intend on using Punjar in your home game, or trying to write Punjar material for Goodman Games, it is worthwhile to see where Harley Stroh was going. Hirelings (2015): "When following a stranger into a black, Chaos-infested hole is a better alternative than going home at night, you might be ready to become an adventurer's hireling." A table with 12 Hireling Qualities is provided. While this material was intended specifically for Punjar, Dungeon Crawl Classics judges may find it useful for any milieu. Caste (2016): Another Punjar scrap, indicating how people treat you depending upon your relative positions on the social ladder. In the House of the Rat: A Fragment (2014): Part of an adventure taking place in Punjar...and one which would well be worth completing by an industrious judge. The adventure is clearly influenced by Fritz Leiber's Lankhmar stories, and I could easily see it moved to that setting without any real change. Unfortunately, Harley Stroh's fragment stops at the most interesting part of the adventure....Or perhaps this is fortunate, as the judge will certainly want to continue from here. How will you write the ending? You will also have to go back and fill in three statblocks. Viking Crawl Classics: There is no date given for this. Who wouldn't want to play vikings in Dungeon Crawl Classics? Harley Stroh grants you the complete write-up of the Ulfberht Sword, "a mythic take on the real blades". These dwarf-made swords grant a unique take on Mighty Deeds of Arms, so that a non-Warrior gains a 1d3 Deed Die to roll on the sword's special table, but a warrior or dwarf uses his normal Deed Die to either roll on the table or, presumable, perform some other Mighty Deed of Arms. "Katanas & Cthulhu" is also mentioned, and this is an idea that should be turned into a real product. DCC-Punk (2015): Some notes on Cyberpunk Dungeon Crawl Classics, which deals almost exclusively with armor and weapons. The Death & Dismemberment table on page 15 relates to this fragment, but it could be used elsewhere. Ideas for using modern weapons with Dungeon Crawl Classics are always welcome, and I am more than happy to see a "Chainsaw hand" given statistics! Vinotok (2013): A carousing table based on the experiences of Harley Stroh and Doug Kovacs in Carbondale, Colorado. Some may be wholly false. The back cover is a map of Punjar, the Tarnished Jewel. Depths of the Croaking Grotto was written “Weird Dave” Coulson, with art by Matt Morrow, Jeshields, and Gary Dupuis. Cartography is by Dyson Logos, and the publisher is Cut to the Chase Games. This level 2-3 adventure is converted to Dungeon Crawl Classics, and is simultaneously available for Swords & Wizardry, Pathfinder, Castles & Crusades, and 5th Edition Dungeons & Dragons. It is the first part of the Memories of the Toad God series. Cut to the Chase's previous series, Wrath of the Kobolds, relied on gnomes without providing a DCC gnome class. This adventure has no such problem. Degenerate toadmen, giant slime toads, and the like are also more "Appendix N"-type material than in the Kobolds series. This adventure could be slotted into the cosmology of The Croaking Fane's spawn of Schaphiroadaz, or it could be tied to Tsathoggua (potentially linking it to The Weird Worm-Ways of Saturn and The Vault of Ash). Ibholtheg the Squamous Toad may well be considered a rival to Bobugbibilz. The inclusion of the Xilonoc people as ancient (and long-gone) Aztec, Toltec, or Olmec stand-ins is also rather hopeful. The judge willing to do the work could presumably convert The Hidden Shrine of Tomoachan as part of an ongoing Dungeon Crawl Classics campaign linked to this series. 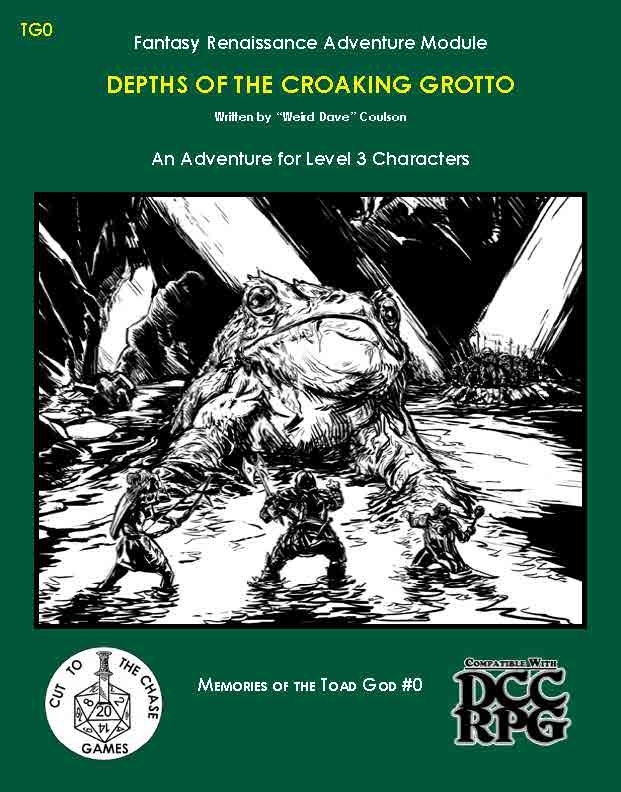 This adventure includes a mix of "old stand-by" monsters, such as a wyvern and manticores, as well as some more "Make Monsters Mysterious" types in the degenerate toadmen and the creatures inhabiting the Croaking Grotto proper. The adventure includes "shadow orcs", which is a nice name, but gives little information as to why they have it. As with Wrath of the Kobolds, the judge may wish to go over the material carefully, adjusting monsters to make them less predictable and adjusting treasure to be more in line with the standard Dungeon Crawl Classics aesthetic. There should never be a generic +1 sword in a DCC campaign. On the other hand, if you are looking for something that evokes the feel of the original TSR adventures, while using the Dungeon Crawl Classics rules, this may well be for you. Demon Drums was written by Tim Callahan. Cover art is by Chris Burnham (front) and Fred Dailey (back), with interior art by Fred Dailey, Nick Burchard, and Tim Callahan. It was published by Moon Dice Games. The print version was originally released as a GenCon 2014 exclusive. Demon Drums is an adventure for level 2 to 4 characters, set in the Crawljammer milieu. This adventure is a direct sequel, of sorts to Red Planet Rendezvous in Crawljammer #2 and Crawljammer #3, although it is not necessary to run either adventure first. It is also a potential introduction to the Crawljammer milieu, giving Earth-bound PCs their first taste of what might await beyond their own world. 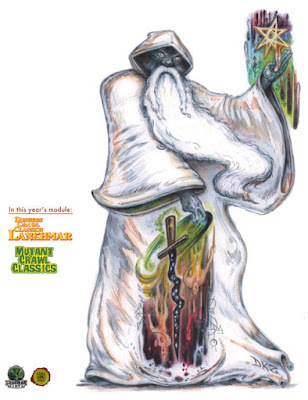 It is unfortunate that there is no direct portal to the Crawljammer milieu from this adventure, although, to be honest, I have no idea how one could have been worked into the existing material seamlessly. 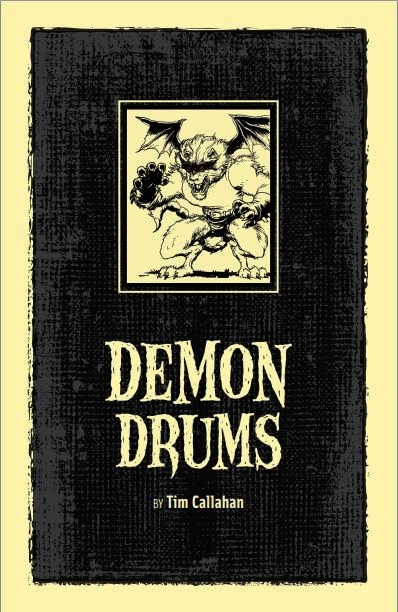 Demon Drums has some tenuous thematic similarities to Jobe Bittman's The One Who Watches From Below, which had been published earlier in the same year...enough to spook players who had played The One Who Watches From Below if they also play through this adventure, but not enough to be certain that the similar motifs were intentional. A judge using both modules in the same campaign could definitely have fun linking the two, though. Strange drumming is heard in the distance. Bizarre creatures battle each other to the death. And what treasures lay beneath the deadly swamp? Will the PCs live long enough to find out? The DCC RPG Reference Booklet was edited and laid out by Jeremy Deram from original material in the Dungeon Crawl Classics core rulebook. The cover art was provided by Doug Kovacs, and interior art by Stefan Poag. Material from the core rulebook was reprinted with permission of Goodman Games. The product was published by People Them With Monsters. Disclosure: I received a proofreading credit, along with Edgar Johnson. This booklet is a series of reference sheets for Dungeon Crawl Classics, saving you from having to flip through the core rulebook to reference a table. They are so useful that I bought one for each player in my regular group when they first became available in print. The cover is stunning. The interior art is evocative and fun. The stock is well chosen, making the whole thing beautifully presented. In addition, there is also a free pdf version, so if you want to print your own, there is no reason that you cannot. Like the Crawler's Companion, this is something no Dungeon Crawl Classics player or judge should be without. 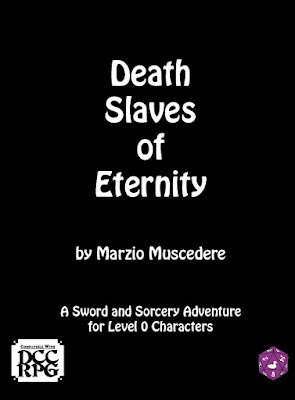 Death Slaves of Eternity was written by Marzio Muscedere. Art is by Luigi Castellani, Matt Morrow, and Brett Neufeld. Cartography is by Kristen Richards. This product was published by Purple Duck Games. Disclosure: I saw, and had an opportunity to comment, on this product before it was released. I have had the opportunity to sling dice with the author now on two occasions, and on one of those two, he bought me beer. So here's what we have. 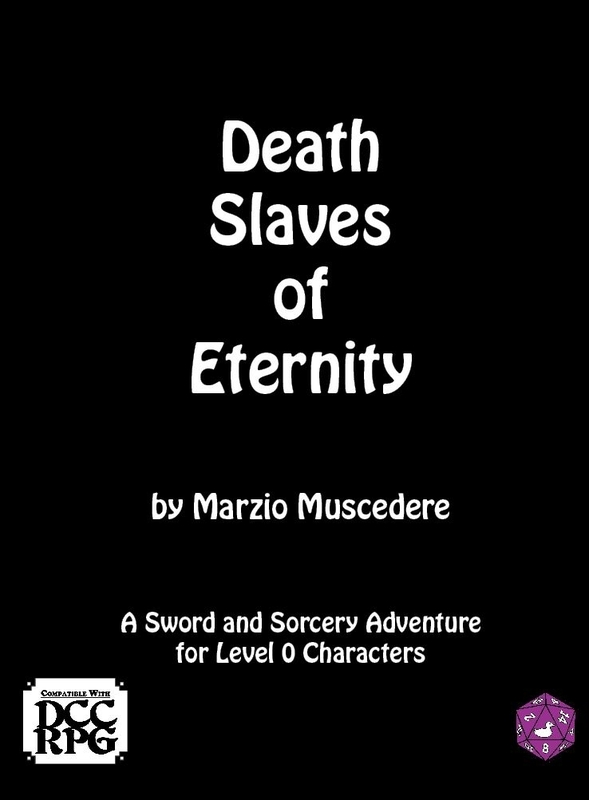 Death Slaves of Eternity is a 0-level funnel that describes itself as "A Sword and Sorcery Adventure". That description is accurate. In addition to the adventure proper, you get a new 0-level occupation table, a complete new patron, and conversions to turn the Dungeon Crawl Classics demi-humans into classes for a humans-only game. This is, perhaps, the most ambitious funnel to date. And it very much meets its goals. There is a mystery to be solved, and specific character occupations play into solving that mystery. This is in addition to rumors and superstitions, giving players a lot to think about right from the get-go. The adventure plays into the sword & sorcery trope that some of the things you fear turn out to be just mortals....but not all of them. Every monster has a reason to be where it is. Its powers and description play into those reasons. There is an endless opportunity to loot...but taking that opportunity will, sooner or later, be your undoing. Speaking of which, there are interesting and appropriate traps and curses. And magic items. There are several storylines weaving through the adventure that the players can directly interact with, and through their actions change the outcome of. I had a tee shirt made that describes Dungeon Crawl Classics as "The game where you fight unknown monsters, speak with alien gods, and find ancient magicks.......and then you reach level 1." Well, this adventure definitely lives up to that description. Information is sometimes repeated more than necessary. You won't want to run this is a 4-hour time slot. The more time you take with it, the better the overall experience will be. You will want printouts of tables, maps, and handouts ready, so you won't want just the physical book but the pdf as well. Which is not to say that it is the "perfect" or "ultimate" DCC funnel. I don't believe that such a thing is possible. Every author throws new things into the mix with everything they write. But it is to say that it is good. Deeply good. "I would have been proud to have written this" good. The author writes, in his introduction, "This adventure is inspired by the vast works of Robert E. Howard and Clark Ashton Smith," and this definitely shows. In fact, there are several nods that aficionados of these authors will not fail to notice. None of them gets in the way, and it doesn't matter if your players don't notice. This is not an adventure that you will want to run in a single sitting. This is an adventure that you will want to linger over, stretching it out over two or more play sessions. Three would probably be ideal. Personally, I would allow PCs to level up in the catacombs once they reach 10 XP. That won't damage the fun in any conceivable way. It should be noted that the patron, Mog'Malu, would be appropriate for use with the goat-headed being from The Portal Beyond the Stars. It is said even the boldest of heroes cower when madness sits the throne, and in the perilous and lurid city-state of Hazruun the Vile - its sultan is indeed mad. For when the body of his only son and heir is found purple and lifeless, strangled in a back alley drinking den - it is decreed all must pay for the crime. Condemned for a murder you did not commit; entombed alive with the corpse of a slain prince; you are trapped in a world of blackness, with no days, no nights, no seasons, only endless existence and the maddening sound of your own screams. But there are worse things to fear in the tomb than the dead. For deep below in the forlorn and time-forgotten halls, shadows stir, ancients speak, and things have learned to walk that ought to crawl – and lost to the ravages of dread antiquity lurks a being who’s only thought, since the beginning of time, is its ravenous desire – to feed! I, for one, hope to see more of the "lurid city-state of Hazruun the Vile". 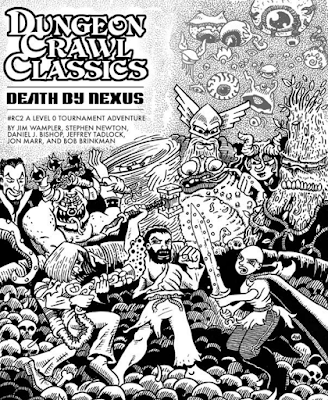 RC2 Death by Nexus is a 0-level tournament adventure written by Jim Wampler, Stephen Newton, Daniel J. Bishop, Jeffrey Tadlock, Jon Marr, and Bob Brinkman. James V. West provided the art and cartography, and Goodman Games published the adventure. Disclosure: I wrote one section of this adventure, The October Wood. Death by Nexus is a tournament funnel. This format has been covered by the Spellburn podcast, and is worth listening to before you jump into the fray. Like all tournament adventures, though, it is easy enough to use in your home games. In this case, you may wish to use only one or two sections per funnel, because this is designed to churn through PCs. Death by Nexus is a DCC RPG Tournament adventure based on the character funnel format. This adventure is designed for 9 players, with each player having only 1 level-0 PC. As each PC dies, the controlling player taps out of the game, and a new player rotates into the game with a brand new PC. The tournament adventure is scored by ranking individual PCs by largest number of encounters survived. Players eliminated from play may re-enter the game with a new PC when another seat opens up at the table. The tournament will be played for a pre-designated amount of time. Players are scored in the tournament as follows: For each encounter survived (an encounter being defined as any time in which initiative is rolled to begin a combat), stamp the player’s character sheet once with the “I Survived!” stamp. When a PC dies, likewise stamp that player’s character sheet with the “Dead” stamp. Remind players to hang onto their character sheets for later event scoring. At the end of the event, the players with character sheets that show the most stamps for encounters survived will be ranked, and the top three numerical survival totals will be awarded 1st, 2nd, and 3rd place respectively. Any ties will be settled by a d20 dice-off between the tying players. Why these stamps are not being sold on the Goodman Games site is beyond me, but if you want to have stamps made for your own use, finding a seller (online or otherwise) should not be too difficult. As a side note, when I had my own stamps made, I went the route of cheaper prices, and failed to realize how small the actual stamp would be. Learn from my mistakes, and get yourself a good-sized, clear stamp. I intend to have new stamps made before GaryCon in 2017. The adventure is broken down into several sections, each of which represents a "Hyper Arena" (essentially a play area with its own rules) on the Nexus of Planes, where the Prime Ones provide sporting entertainment for gods and patrons alike. Your PCs are that entertainment. Ice, Wind, and Fire by Jeffery Tadlock: Vie for magical weapons within a hostile environment inhabited by contending elementals. Over the Edge of the World by Bob Brinkman: Contestents are transformed to represent their alignments, then fight in three dimensions through an infinite void. Beware the Chaos Storms. Take One for the Team by Stephen Newton: Vie for the Implements of Motivation, which can either provide offensive or defensive power. And corruption. The October Wood by Daniel J. Bishop: In a heavy wood, either engage in straightforward battle or break the innumerable urns to risk chance. Any Given Thorsday by Jim Wampler: Fight the battle of Ragnarok at the End of Time, using the Armaments of the Gods. The Garden of Forbidden Power by Jon Marr: An interesting battle in a garden created by a mad sorcerer. This is the second "DCC Cabal" tournament module, organized by Jim Wampler for Goodman Games. As with the previous RC module, The Hypercube of Myt, and the later one, The Shambling Un-Dead, Mr. Wampler contacted a number of writers to create a single part of the adventure. It was a stated goal in this particular case to showcase some of the fun stuff from higher-level play within the 0-level format. I think that all sections accomplish that pretty well. DCC #83.2 Death Among the Pines was written by Michael Curtis, and is part of the Shudder Mountain series started with The Chained Coffin. The cover, by Doug Kovacs, is excerpted from the cover from The Chained Coffin. Interior art is by Peter Mullen and Stefan Poag. Mark Allen did the cartography. Goodman Games is the publisher. This practice of re-using cover art to indicate that something is part of the same setting started with the supplements to Harley Stroh's Peril on the Purple Planet, and is also used in the materials supplementing Journey to the Center of Aereth. It is a good system to indicate that a new produce belongs with a particular setting, along with the module numbering and the digest-sized format. 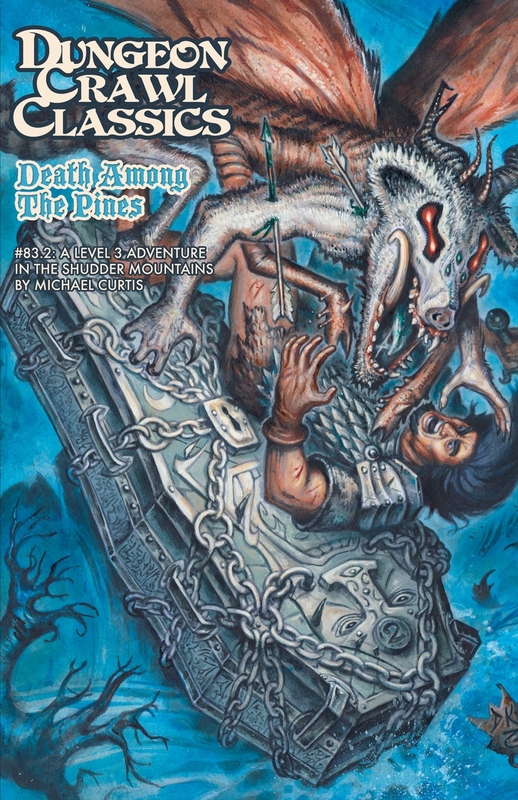 Death Among the Pines is a 3rd level adventure, which takes place while the PCs are travelling from Point A to Point B. Although it fits perfectly into the Shudder Mountains setting, it would take very little work to make the adventure fit into most Dungeon Crawl Classics campaign milieus, which makes the adventure doubly useful. In addition to the prevalent influence of Manly Wade Wellman, which is strong throughout the Shudder Mountains material, there is a strong Robert E. Howard influence (at least, it seems so to me), particularly in reference to his Kull stories. Welcome to pastoral Holler Hollow, a quaint hamlet deep in the Shudder Mountains. Here you’ll find friendly Shudfolk, downhome cooking, and a jug of stump whiskey if you mind your manners. But not all is what is seems in the Hollow: a restless spirit stalks the lane at midnight, terrifying the locals. Staunch-hearted heroes are needed to unearth the secrets of Holler Hollow and lay the spirit to rest. Are you up to the task? 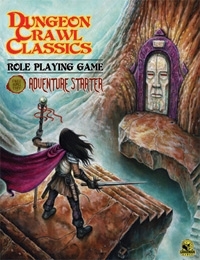 The Dungeon Crawl Classics core rulebook was written by Joseph Goodman, with additional writing by Michael Curtis, Harley Stroh, and Dieter Zimmerman. It contains art by Jeff Dee, Jeff Easley, Jason Edwards, Tom Galambos, Friedrich Haas, Brad McDivitt, Jesse Mohn, Peter Mullen, Russ Nicholson, Erol Otus, Stefan Poag, Jim Roslof, Chad Sergesketter, Chuck Whelon, and Mike Wilson. Multiple covers have been printed, with the work of Doug Kovacs, Jeff Easley, and Peter Mullen. The core rulebook is published by Goodman Games. Disclosure: I have written a number of products for the Dungeon Crawl Classics game, including some for Goodman Games. I have written about this product before, and my general impression remains unchanged. Physically, this is a beautiful book. I currently own three copies of the rules - a 1st print, a wizard cover variant, and a 4th printing soft cover. The art in this tome is amazing; you should be able to come up with dozens of adventure ideas merely by flipping through the pages and looking at the illustrations. I was going to list some of my favorites, but looking through the book, I think that is probably impossible. There is just too much good stuff here. In my opinion, the best role-playing game book ever produced was the 1st Edition Advanced Dungeons & Dragons Dungeon Master's Guide by Gary Gygax. This is a close second, and sits proudly on the same shelf. 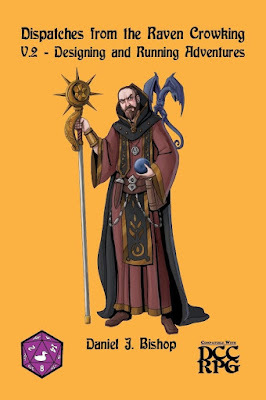 If you are interested in the rules, but have yet to play (or purchase) the game, the Spellburn podcast gives a rundown of many of DCC's unique aspects. An introduction to Dungeon Crawl Classics can be found here. Other topics include 0-level funnels, classes (ex. clerics, thieves, wizards, and halflings), the magic system (mercurial magic and spell duels), mighty deeds of arms, monsters, magic items, dragons, and demons. The 1st to 3rd printings contained two adventures, The Portal Under the Stars by Joseph Goodman and The Infernal Crucible of Sezrekan the Mad by Harley Stroh. Both adventures were reprinted from the DCC Free RPG Day Adventure Starter. The 4th printing replaces The Infernal Crucible of Sezrekan the Mad with another Harley Stroh adventure, The Abbot of the Woods. This last is a rather nasty adventure for characters of level 1 to 3, and which may easily see party attrition. Or extinction. Obviously, I am a fan. 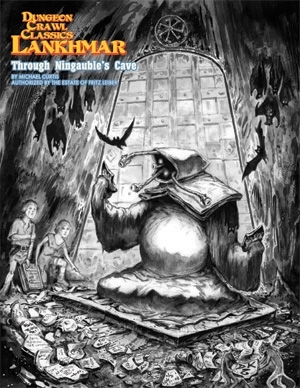 DCC Lankhmar: Through Ningauble's Cave was written by Michael Curtis. Art is by Doug Kovacs. This product was published by Goodman Games and authorized by the estate of Fritz Leiber. 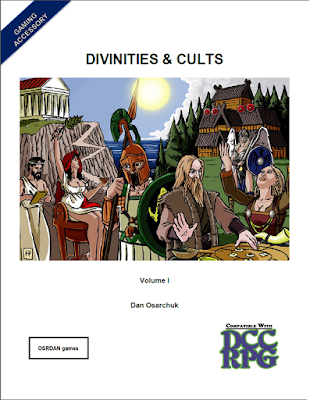 This was the first DCC Lankhmar product, to be followed by (at the time of this writing) The Patrons of Lankhmar, Masks of Lankhmar, and The Madhouse Meet in the DCC Free RPG Day 2016 offering. The DCC Lankhmar boxed set, and other DCC Lankhmar products, will certainly follow (and be featured in this blog). This supplement describes Ninguable of the Seven Eyes and the endless caverns in which he lives. Here you will find the means to transport your PCs from any Dungeon Crawl Classics milieu to Nehwon, and vice versa...travelers to Nehwon from other realms are not unknown in the stories of Fritz Leiber. Michael Curtis offers a table of wanderers who might be encountered in the cave, a description of the known points where the caves emerge, and the known landmarks of the Bottomless Caves. Doug Kovacs provides geomorphs that ensure no two trips through Ningauble's domicile will be the same. When describing the entrances and egresses where the cave may emerge, Michael Curtis offers a sort of whirlwind tour of Nehwon, including adventure ideas and sample encounters. A bibliography of relevant stories is also provided. This is a nice touch, helping the judge review the setting (and its occupant) through Fritz Leiber's own words. Finally, Ningauble is described as a patron, including all relevant information except that relating to spells. Altogether a worthy introduction to DCC Lankhmar, which serves to whet the appetite for that which is to come! 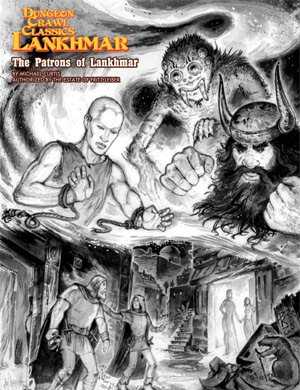 DCC Lankhmar: The Patrons of Lankhmar was written by Michael Curtis. It contains art by Doug Kovacs, Brad McDevitt, and Stefan Poag. It was published by Goodman Games, and authorized by the estate of Fritz Leiber. Disclosure: I have done some writing for the final DCC Lankhmar set, including the patron spells for Mog the Spider God. The product contains abbreviated patron write-ups for 6 of Lankhmar's supernatural beings, including everything but patron spells (or their names). In addition, Mr. Curtis kindly provides a list of where more information can be found. Discerning readers will note that the number of patrons mentioned in the introduction is both "a half-score" (10) and "six", suggesting that previous drafts may have included other patrons. Ningauble of the Seven Eyes is mentioned, but the reader is directed to Mr. Curtis' Through Ninguable's Cave. A list of stories for further information on Ningauble is also provided. From experience, I can tell you that writing patrons is one of the most difficult tasks that a Dungeon Crawl Classics writer or judge may face. Writing patrons from literary sources, without losing the tone or feel of those entities is doubly challenging. This is yet another case where Mr. Curtis shows mastery of the craft, as well as a deep understanding and love for Fritz Leiber's material. Most of these patrons are transferable to non-Nehwon game milieus without any work at all. Issek of the Jug, and particularly Sheelba of the Eyeless Face, may require some tweaking. You should be able to find some use for the Rat God or Mog in any campaign milieu whatsoever, and Death is omnipresent. That the Death of Nehwon is a relatively "minor death" in Dungeon Crawl Classics terms does not necessarily make him less impressive. For the record, my own Belshar of the Five Eyes was intended as a take on a Lankhmarian patron in the style of Sheelba and Ningauble. Umwansh, Father of the Waves, was intended to convey more of Michael Moorcock's Straasha than Fritz Leiber's Sea King. 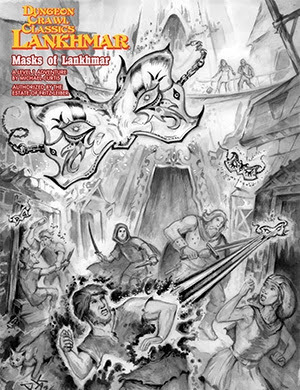 Masks of Lankhmar is a 1st level adventure written by Michael Curtis and published by Goodman Games. It contains art by Doug Kovacs and Brad McDevitt. This is part of the DCC Lankhmar series, published under license from the estate of the late Fritz Lieber. DCC Lankhmar characters start at 1st level, rather than experiencing a 0-level funnel, so this is an introductory adventure. This is an urban-based scenario, as is appropriate for a game set in Nehwon. Not all of Fafhrd and the Gray Mouser's adventures occurred in Lankhmar's sprawling metropolis, but enough did to make the city feel more than "right" for a first outing. In DCC Lankhmar terms, this is the "meet", where Our Heroes encounter each other for the first time. The adventure is written to accommodate the free-wheeling style of play in an urban environment (and DCC Lankhmar overall), including an optional encounter and event. Some rules for chases are included (pending full rules when DCC Lankhmar is released), which may be useful to judges of any flavor of Dungeon Crawl Classics. Certainly, the adventure would not be out of place if reskinned to Harley Stroh's Punjar. The Fritz Leiber influences are strong, including a potential trip to the Plaza of Dark Delights. An encounter with "crypt spices" offers a nice homage to the Mouser's entrancement in Bazaar of the Bizarre. Appendix M is a blog by writer and artist Jon Wilson, whom some may know better as bygrinstow. 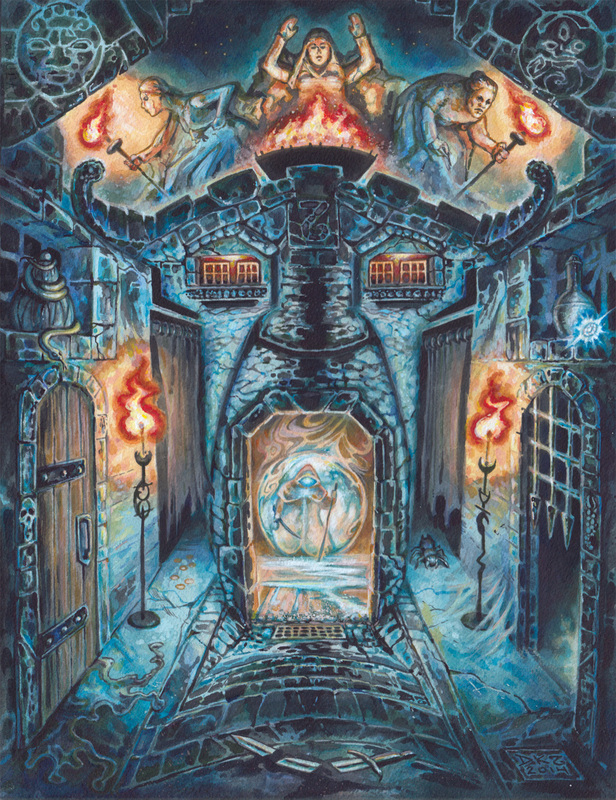 DISCLOSURE: Jon Wilson did the illustrations for the free version of The Thing in the Chimney, the original Dungeon Crawl Classics holiday adventure. A creature from this blog was used (with permission) in Garett Oliver's The Snow Queen in D.A.M.N. #1. When I first started this blog, I intended to include only products that were available either physically or in pdf format. Then, thanks to the Purple Sorcerer online tools, I decided that I should also include relevant electronic applications. However, this blog contains such a plethora of interesting Dungeon Crawl Classics creatures and NPC encounters that I decided it would be remiss not to include it. If you are trying to assemble a "DCC Monster Manual" for your home game, perusing Appendix M makes a good start. 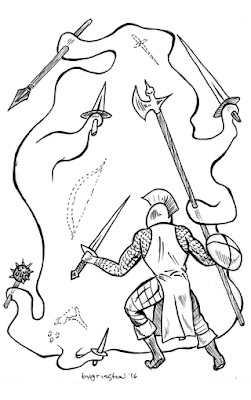 Described as "A Confabulation of Unique Monsters for The Dungeon Crawl Classics RPG (DCC RPG) and Suitable for Other Sword & Sorcery Role Playing Games, Including Those of The Old School Renaissance (OSR)", Appendix M has been around since 2012. It contains such useful entries as the false (and true) dryad, which might be encountered as a follow-up to The Portal Under the Stars; the wizard known as Tahn-Ru the Trapmaster; the Doctor Who inspired Husks of Josiah, and even a Murder Hobo PC class. The creations available here span the gamut of Dungeon Crawl Classics milieus - there are beings at home in Umerica, in the phlogiston flux between planets, on the Purple Planet, or in a local dungeon or foreboding wood. Note: Gentle Reader, as I am now including select blogs in the DCC Trove of Treasures, please let me know of any blogs that you may feel are appropriate for inclusion! The DCC Free RPG Day 2016 offering was written by Michael Curtis and Jim Wampler. It features art by Doug Kovacs - including not one, but five separate covers. It was published by Goodman Games. This product consists of two adventures. The first adventure, The Madhouse Meet, is a 1st level adventure for DCC Lankhmar, written by Michael Curtis. It offers some insight into the mechanics of the upcoming DCC Lankhmar, as well as providing an entertaining adventure with a truly Nehwonian feel. 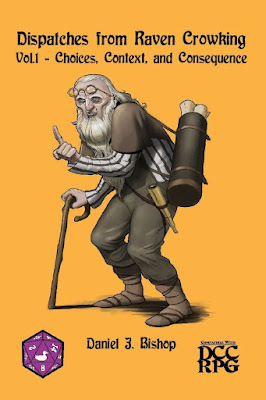 Unlike standard Dungeon Crawl Classics characters, DCC Lankhmar PCs begin their adventuring careers at 1st level. This makes The Madhouse Meet a starting adventure, in which "the band" is being assembled for the first time. It is pretty clear that Michael Curtis "gets" Fritz Leiber's world, both in terms of its tropes and its feel, and this adventure is no exception. The second adventure, The Museum at the End of Time, is a funnel for Mutant Crawl Classics, written by Jim Wampler. This is the first published MCC adventure, and it gives a good idea what the setting will feel like. The PCs are youths from the Tribe of the Cog who seek to become adults by heading out into the Glow Desert and discovering what relics they might find from a ancient museum. This adventure receives a fair amount of coverage on Sanctum Secorum Episode #15 - Kamandi: The Last Boy on Earth. 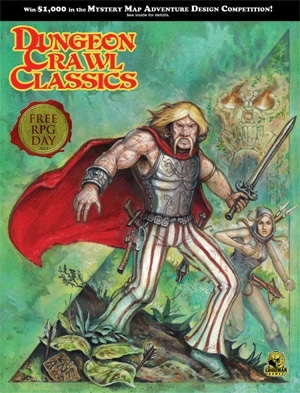 In 2015, Goodman Games offered the Dungeon Crawl Classics Judge's Screen for Free RPG Day. The art is by Doug Kovacs. There is not a lot to say about this product. Being Doug Kovacs art, the art is phenomenal. Being Dungeon Crawl Classics tables printed on the other side, the tables are useful. This is a product that is really useful only in print, but if you are willing to assemble it yourself, you can get the pdf here. The DCC/Xcrawl Free RPG Day 2014 offering was written by Terry Olson and Brendan J. LaSalle. It contains art by Doug Kovacs, Stefan Poag, and Jesse Mohn. It was published by Goodman Games. As with the previous year's offering, this product contains one Dungeon Crawl Classics adventure and one Maximum Xcrawl adventure using the Pathfinder rules. The Dungeon Crawl Classics adventure is Elzemon and the Blood-Drinking Box, by Terry Olson. This is a 1st level adventure, which sees a group of PCs infiltrate a rather disgusting wizard's sanctum to steal the titular blood-drinking box. I ran this adventure twice: once at Dueling Grounds on Free Role-Playing Game Day, and once at home in preparation for the public run. There is a seemingly-endless stairway in the adventure, which spirals downward for a very long time. This is a spiral stairway, with an open shaft in the middle, far too wide to see the opposite side. In my home prep game, each of the players was controlling more than one PC. So disconcerting was the stairway that one player had a character leap off the stairs in the vain hope that I would tell the players what happened to him. Few players these days carry the necessary supplies - even the torches or lantern oil! - for a two-day hike down an incredibly long stairwell. Fewer still carry the supplies to second-guess themselves, and hike back up more than once. Although this isn't a "trap" in the classical sense, in actual play it functions as one. Most great adventures include some decision-making that cannot be resolved simply by rolling dice. Elzemon and the Blood-Drinking Box is no different in this regard. There are at least two decisions the party must make that will probably require some discussion: Now that we have this box, who is going to feed it? And what are we going to do with it? The answers to both questions have enough potential repercussions that players shouldn't rely on snap judgments. As a point of interest, "Elzemon the Forgotten" is the quasit in The Infernal Crucible of Sezrekan the Mad, by Harley Stroh, which is featured in both the Dungeon Crawl Classics core rulebook (1st to 3rd printing) and the DCC RPG Free Role-Playing Day Adventure Starter from 2011. Is this the same quasit? Are all quasits named Elzemon? Or is "Elzemon" the infernal equivalent of "John Smith"? Elzemon and the Blood-Drinking Box is reprinted in Chaos Rising, which also reprints The Infernal Crucible of Sezrekan the Mad. You can also hear Terry Olson discuss the adventure on Spellburn. Dungeon Detonation! is the Maximum Xcrawl adventure, written by Brendan J. LaSalle. As with the DCC RPG/Xcrawl Free RPG Day 2013 offering, this is a Pathfinder adventure, and will get no in-depth coverage. There are already three converted Xcrawl adventures available for Dungeon Crawl Classics, and a DCC version of Xcrawl is in the works. Afficianados of the Dungeon Crawl Classics game will know Brendan LaSalle from The Hole in the Sky, as well as (possibly, if you are lucky) his judging at many conventions. At the time of this writing, he featured on the most recent Spellburn podcast, where his newest DCC adventure, Neon Knights, is mentioned. 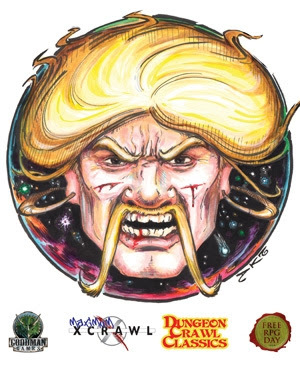 The DCC RPG/Xcrawl Free RPG Day 2013 offering was written by Daniel J. Bishop and Brendan LaSalle, with art by Doug Kovacs, Jeremy Mohler, and Brad McDevitt. It was published by Goodman Games. Disclosure: I am the writer of the Dungeon Crawl Classics adventure in this product. This product contains two adventures, The Imperishable Sorceress for Dungeon Crawl Classics, and Maximum Xcrawl: 2013 Studio City Crawl by Brendan LaSalle for the Pathfinder version of Xcrawl. The Imperishable Sorceress was the first writing that I had done for Goodman Games, and it came about as a request from Joseph Goodman for a short adventure. I was imagining that he was gearing up for the first DCC Annual, or that he was looking for a second adventure for another module (like The Balance Blade is included in The 13th Skull), but that turned out to not be the case. The Dark Master accepted the first pitch I offered, with the minor exception that I was considering recruitment offers leading the PCs to the Cleft Mountain, ala Fritz Leiber's Stardock. I had just finished reading Stanley Weinbaum's The Black Flame when I made this pitch, and, along with Stardock, it was a primary inspiration. The original text included mountain climbing tables to more closely reflect Stardock, but playtests indicated that too many encounters on the relatively linear mountainside detracted from the whole. If you like the "secret doors" in the adventure, you have Joseph Goodman to thank. He wanted at least one, and I had to devise a way to make a secret door work in an ancient structure like this. The Builders are, of course, inspired by H.P. Lovecraft. The “Adamantine Mole” was inspired by the "Iron Mole" from Edgar Rice Burrough's At the Earth's Core, and may lead PCs to Harley Stroh's Lost Agharta from Journey to the Center of Aereth and The Lost City of Barako. Ivrian the Unkind is named for the Gray Mouser's paramour in Ill Met in Lankhmar and, in particular, The Unholy Grail. The ghosts of fish were inspired, in part, from the 1986 film From Beyond, itself based off a story of the same name by H.P. Lovecraft. 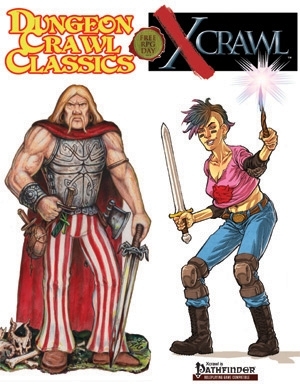 Brendan LaSalle's Maximum Xcrawl: 2013 Studio City Crawl was written for Pathfinder, although it could be converted to Dungeon Crawl Classics. Nonetheless, because it is not a DCC product, it will not be getting in-depth discussion here. There are already three converted Xcrawl adventures available for Dungeon Crawl Classics, and a DCC version of Xcrawl is in the works. Afficianados of the Dungeon Crawl Classics game will know Brendan LaSalle from The Hole in the Sky, as well as (possibly, if you are lucky) his judging at many conventions. At the time of this writing, he featured on the most recent Spellburn podcast, where his newest DCC adventure, Neon Knights, is mentioned. 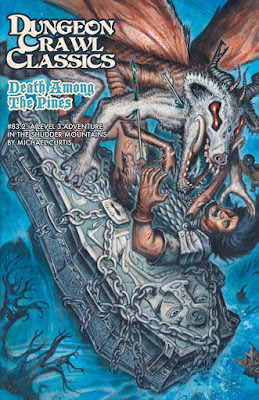 The DCC RPG Free RPG Day 2012 offering was written by Michael Curtis and Harley Stroh. Art was supplied by Doug Kovacs, Brad McDevitt, and Peter Mullen. It was published by Goodman Games. Disclosure: This was the first year where I joined the Road Crew, and ran a game of Dungeon Crawl Classics at Dueling Grounds in Toronto. Consequently, I received both adventures before their publication in order to prep for the event. The Undulating Corruption, by Michael Curtis, is a 5th level adventure in which magical corruption can be removed...if you dare to take the risk! Although a linear scenario, this would be a great adventure for a convention game, or for inclusion in a home campaign. Because the goal is removal of corruption, this is a real "Quest For It" adventure that every Dungeon Crawl Classics judge should have available. The second adventure is Harley Stroh's The Jeweler that Dealt in Stardust, which I once listed as the #2 must-have DCC adventure, right behind The Wizardarium of Calabraxis. This adventure is extremely creepy, and would feel right at home in a Robert E. Howard or Fritz Leiber story. I discussed both adventures at some length at Raven Crowking's Nest. Both are reprinted as part of Chaos Rising. This product also brought us the Mystery Map Adventure Design Competition, which was won by Jobe Bittman and resulted in the excellent The One Who Watches From Below. Having written some well-received material for Purple Duck Games, I was tempted to enter this contest, but ultimately decided against it. For the curious, I was considering creating an adventure that took place inside the jeweled amulet pictured on the map. My idea was that the amulet was the prison of an immortal, and that by freeing the immortal, the PCs would change the history of the campaign world. Alternately, they could risk being trapped forever in the jewel in order to keep the immortal imprisoned. Or some could sacrifice themselves so that others could escape. (1) The odds that someone would have a better idea were extremely high. Jobe Bittman proved that I was correct on that score. (2) I already knew my idea, but if I somehow won, I would never discover the ideas submitted by anyone else. Imagine that by some fluke my idea was selected. A world without The One Who Watches From Below? What kind of monster would make something like that happen? I would be curious what other people's ideas were for using the Mystery Map. I bet that there are dozens or more of submissions which would be worthy of an adventure in their own right! It is a real pity that Goodman Games hasn't put out a "runner up" booklet cataloguing these. The DCC RPG Free Role-Playing Day Adventure Starter was written by Joseph Goodman and Harley Stroh, and published by Goodman Games. The cover is by the talented Doug Kovacs, and interior art is by Jeff Easley, Tom Galambos, Doug Kovacs, Peter Mullen, Stefan Poag, and Jim Roslof. The Dungeon Crawl Classics beta rules were available for free from Goodman Games, and the system was getting a real shakedown cruise as playtesters kicked the tires and mixed the metaphors. Then, on Free Role-Playing Day in 2011, the DCC RPG Free Role-Playing Day Adventure Starter appeared to the delight of eager gamers everywhere. I was one of those eager gamers. Within we found a brief overview of the Dungeon Crawl Classics role-playing game, The Portal Under the Stars, and The Infernal Crucible of Sezrekan the Mad. 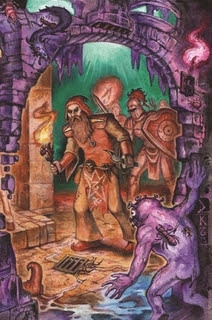 The Portal Under the Stars is the first published funnel for the Dungeon Crawl Classics role-playing game, which can double as a 1st level adventure. It was written by Joseph Goodman. The Infernal Crucible of Sezrekan the Mad is a 5th level adventure by Harley Stroh. Both adventures were reprinted in the first printing of the core rulebook. This product offered an excellent glimpse into the game that Dungeon Crawl Classics would appear as when published, both in terms of its artwork and its writing. D.A.M.N. #1 was written by Paul Wolfe, Daniel J. Bishop, Garett Oliver, and Godric McKellan. Cover art is by David Fisher. Interior art is by David Fisher, Byrinstow, and Daniel J. Bishop. The issue was published by Straycouches Press. D.A.M.N. stands for DCC RPG Adventure Magazine & News. Disclosure: I wrote two pieces for this issue, contributed a spot illustration (p. 54), and contributed (along with the illustrious Paul Wolfe) some cartography (p. 27). The cover illustration depicts creatures from the adventure I wrote for this issue (more on which later). I am credited as a contributing editor. And I have known the editor, Garett Oliver, for a very long time, which he alludes to in his "Note from the Editor". When Garett decided to create D.A.M.N., he asked me if I would contribute to the first issue. Of course, as a friend, I was delighted to do so. Around this time the estimable Ray Harryhausen passed, and I was asked if I would create something that was an intentional homage to him. The Mysterious Valley was the result. It received the cover slot - with an intentional nod to the Barbarian class by Godric McKellan - largely because of Mr. Harryhausen's passing. It has to be said that, when D.A.M.N. was being put together, Garett had no background in editing or layout. What he had was a real desire to see the thing through. Although he made a valiant effort to jump into the fray, he found himself facing some personal problems shortly after getting started. The result is a contributing editor credit, as I helped him with both layout and his own adventure in this issue. Forsaken Reavers of Praeder Peak: Author Paul Wolfe presents an adventure designed for 2nd-4th level characters. As it appears first in the magazine, this may be the first mini-hexcrawl published for Dungeon Crawl Classics. Not only does this adventure include the memories of dead Viking-like warriors, but it offers a write-up for Weal, the Queen of Abominations, including the 3rd level patron spell, soul bind. Let it be known that I like Paul Wolfe, and I like his work. Moreover, when I needed better cartography to layout The Snow Queen, Paul stepped in like a boss. As with Curse of Cragbridge, Paul brings events from the past into focus for the PCs, and their understanding of events from long ago ultimately determines how successful they can be in the adventure. 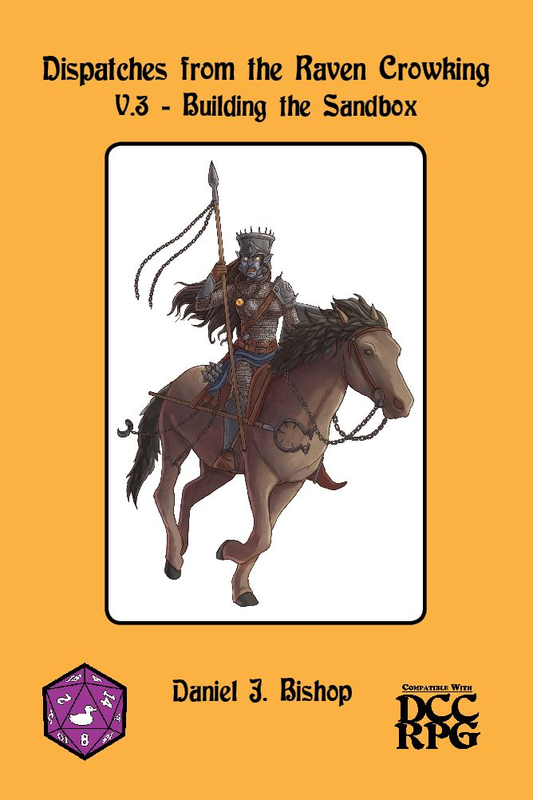 This is a cool element to incorporate, and it reminds me of some of Robert E. Howard's non-Conan work. The Mysterious Valley: This is my adventure for D.A.M.N. #1, and it is essentially a hexcrawl mini-setting where other adventures can be placed. Harhasan Valley is named for Ray Harryhausen, and the entire adventure is (mostly) a celebration of the master of stop-animation's work. Most of the creatures you can encounter are directly inspired by Harryhausen films. A few beings are more directly inspired by Edgar Rice Burroughs or The Land of the Lost. The Ruined City at Area 7 is directly inspired by Rudyard Kipling's The Jungle Book and The Second Jungle Book. It was my hope that The Mysterious Valley could provide a campaign backdrop to other Dungeon Crawl Classics adventures. Adventures could be set in the Ruins of Durdarian, the aforementioned Ruined City, various cavern systems, or Harhassan's Tower itself. Eventually, a group could brave the Creator's Dragon and become defacto rulers of the Valley itself. As a result, The Mysterious Valley contains a variety of potential allies, encounter areas, potential foes, and levels of difficulty. If you, or anyone you know, has used the material in this way, I would love to hear about it. The Snow Queen: This adventure, by Garett Oliver, is, as far as I know, his only published adventure, for Dungeon Crawl Classics or otherwise. It uses a creature from Bygrinstow's admirable Appendix M blog, with permission. Although a linear adventure as written, there is room for expansion by the interested judge. In addition, there are rules for extreme cold, which could be used in almost any DCC campaign taking place in Arctic or Antarctic areas. New Class: The Barbarian: Author Godric McKellan's version of the Barbarian, which includes a 0-level occupation list because barbarians are treated similarly to how racial classes work in Dungeon Crawl Classics. A fishmonger or a gongfarmer does not simply decide to be a barbarian. You have to be born to it. Interestingly enough, a 5th level Chaotic barbarian is a "Dragonrider"...what that actually means in game terms is left to the judge and his players to decide. Converting Material to DCC RPG: This article was an expansion of a blog post on Raven Crowking's Nest. Garett requested in, in particular, because conversion of materials when D.A.M.N. #1 came out was a bit of a hot topic. The plethora of Dungeon Crawl Classics materials now available eases the need to convert from other systems, but probably not the desire. Not only are there classics of early gaming that would make excellent Dungeon Crawl Classics adventures (I myself have used, among others, The Albuquerque Starport, The Sinister Secret of Saltmarsh, Eye of the Serpent, Death Frost Doom, and Joseph Goodman's own The Mysterious Tower as DCC adventures). The existence of games specifically intended to reproduce the worlds of Appendix N fiction - games like The Dying Earth, Conan: The Roleplaying Game, Hawkmoon, MERP, and The One Ring - provide obvious resources that one may like to convert. TSR's adventures set in Lankhmar or Pelgrane Press' adventures set on Vance's Dying Earth, provide a wealth of potential material for the Dungeon Crawl Classics judge eagerly awaiting Goodman Games' products for these worlds. If the judge is so lucky as to own a first print of the AD&D Deities & Demigods cyclopedia, why not use it to stat out creatures from the Cthulhu and Moorcock mythos? If you are awaiting Mutant Crawl Classics or using Crawling Under a Broken Moon, why not convert old Gamma World or newer Mutant Future adventures? You may discover that your conversions lead you in wholly new directions, and spawn original materials of your own. If you enjoyed the first issue of D.A.M.N., please leave a note in the comments section, below. I know that Garett felt as though he let the community down when he was forced to pursue economic goals over passion (eating and having a roof sometimes take precedence over gaming), I would really like to be able to show him how much that first issue was actually appreciated by the DCC community.